We try to bring an atmosphere of work, discipline and love of the game. We just like to have fun at what we are doing. I think Brad does a magnificent job of bringing fun, the combination of work and seriousness. Somewhere in a combination of Larry (Bird) and Kevin (McHale). I was impressed by his (Stevens) temperament, his intelligence and his work. How he interacted with his players. How he didn't lose his cool. How he coached forward instead of coaching backwards. And I loved his temperament with the referees. It was always about the players. I loved his humility. Larry was an introvert with a sharp sense of humor, and McHale was a gregarious, happy go lucky sort who nevertheless was a rugged competitor when between the lines. Although Bird could be a prankster himself, he was usually quite serious. Kevin was the one who put pieces of wadded paper in the open mouths of sleeping teammates while their heads reclined on airplanes. Kevin ate pizza on the bench when hurt, joked with the opposition on the foul line, almost always talking. “Why can’t you be more like Larry?” asked Bill Fitch, coach of the Celtics from 1979-83, who was at times exasperated by McHale’s early less serious basketball dedication, at least compared to the no-nonsense Bird. “Because I have a life,” replied Kevin. I rarely saw "Whow". Occasionally I do. When I saw Kyrie in the Finals the last two years, in one game he had me say "Whow" eight times. Al (Horford) and Kyrie are big reasons why Jaylen and Jayson have thrived. The phone interview ended with Danny being asked by analyst Chris Webber, "Yes or no - is the world flat?" 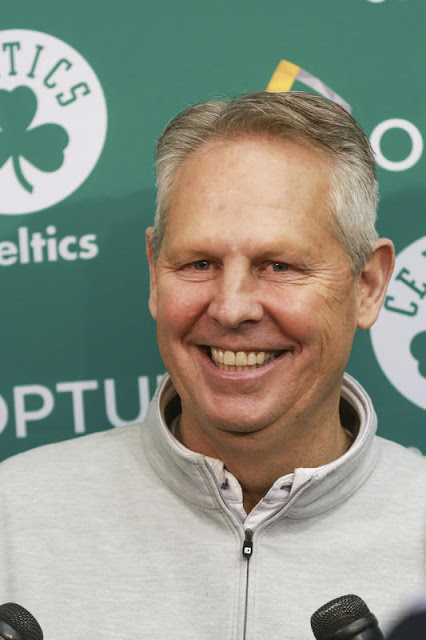 Ainge responded, "No, but I know for 94-feet with Kyrie on it, it is flat." Former Piston Iaiah Thomas laughing because he had to sit next to McHale during the broadcast with Danny Ainge on the phone is hilarious. The jokes would be worth hearing. A combination of fun, work and seriousness. Just like Brad brings to the Celtics team.